Our “gogga” of the month for October will cause prematurely ripe fruit and vegetables, which rot soon after. It’s the fruit fly. A preventative spraying programme for fruit fly and coddling moth must be followed every two weeks from 80% blossom fall. Alternatively a bait may be put out – but the bait must often be replaced. 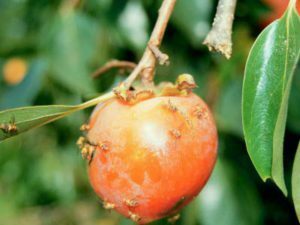 Often, the fruit is opened and is infested with worms, with no outside damage to the fruit. This is because the eggs are laid and the fruit forms around these. If a preventative spraying programme is not followed, most fruit will be damaged. Visit your local GCA garden centre for advice on the best solution for you!